Photography is one feature that no one can afford to take lightly. It is the marvel of photography that has help keep memories of events afloat much after time has passed. It is on this aspect that images captured become real wealth in the long run. Wedding photography may be bit different from the artistic value that defines professional photography but in terms of value, it is no less important. Marriage is once in a life time affair, at least in principle. Nobody thinks for divorce and second marriage despite a myriad of problems. In fact, at some instances, married couples that are constantly fighting can sometime take a break; and relive those moments of happiness to spark new romances in their otherwise empty and predictable married life. Thus, to capture those emotional moments and relive the period as time passes is indeed a worthy and a valuable treasure. But the advent of amateur and fake photographs and their desire to earn some quick money has seriously eroded the quality of the print in terms of religious importance and its artistic appeals. Not only does a photographer have to know about the art of photography, he also must have a profound knowledge of the different marriage style practiced by different Indian communities. Things that are considered as auspicious must be clicked no matter what. 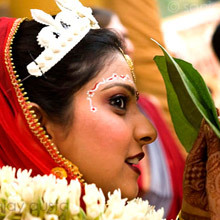 Indian marriages have different stages given the vast religious beliefs, cultures and tradition. Wedding ceremony (prior or post marriage) can even last for a week. Photographers have to capture the wedding process from several angles which amateur and fake photographers lack because of lack of training and experience. The business side of photography demands that you better consult a professional photographer who has established quite a reputation for himself. The whole idea is to hire professionals while keeping in mind the possible case of forgery by well publicized wedding photography agencies. He is aware of several aspects required for taking photographs. He must use professional cameras to ensure the qualities of the prints are at the best.